Like Treasure Island before it, The Story of Robin Hood and His Merrie Men was made using the money Disney made in the U.K. during World War II, which was not allowed to be exported. The film was shot entirely in England, had an entirely British cast, and used a mostly British crew, with the exception of producer Perce Pearce who was Walt's producer for all of his early British films. Walt Disney spent some time in England to supervise production as well. 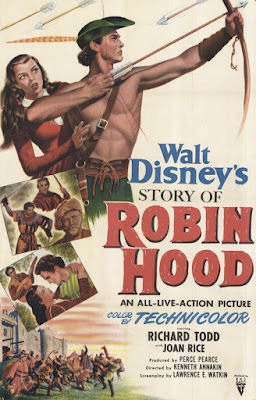 While this was Disney's first film version of the classic tale of Robin Hood, there had already been more than 20 film versions, one of which was released the previous year. The most famous version starred Errol Flynn, but Walt Disney admits to having never seen that film. However, director Ken Annakin screened it to make sure that this version was different. As a result, the final battle between Robin Hood and the Sheriff of Nottingham is very unique and anyone comparing the two versions is sure to notice the differences. The Disney version is notable for expanding the relationship between Robin Hood and Maid Marian, a subplot that had taken a backseat in previous film versions. The film opens with a minstrel singing about Robin Hood, who reappears several times to help move the story along. Robin and Maid Marian are playing in the forest when a servant comes to find her. King Richard is leaving for war and has put his brother, Prince John, in charge of England. Robin's father is killed for speaking out against the new taxation under Prince John's rule, but Robin escapes, hiding out in the wood. Many men join Robin, who becomes known as Robin Hood and starts robbing the rich and giving the money to the poor and overtaxed citizens of England. Little John quickly joins Robin and his crew and they gain an ally in Friar Tuck. Over time, King Richard is captured and Prince John refuses to pay, claiming he can't afford it because of the money he has spent tracking down Robin Hood. Maid Marian returns and finds that her old friend Robin has become Robin Hood, so she sneaks out of the castle to find him. She collects money from Robin and his men to donate for the King's ransom to prove to the Queen that Robin Hood is good. Robin Hood steals the money that the Sheriff has been hiding and reveals it to the public, forcing him to give it to free the King. Prince John creates another plot to have his soldiers dress as Robin Hood's men and rob the Queen, but Robin puts a stop to it. When he finds out that Maid Marian has been locked up, he sneaks into the castle to free her, but is injured in the process. King Richard returns, makes Robin an Earl and Marian agrees to marry him. The film ends with the minstrel walking into the woods singing. Walt Disney's The Story of Robin Hood and His Merrie Men premiered on June 26, 1952. Critics praised the film for the most part, delighting in the emphasis on the characters and the rich environment, which previous versions lacked. I have not been able to find any information about how the film did at the box office. Disney's live action Robin Hood is a wonderful film. It is well written, the acting is great and the locations are beautiful. Richard Todd shines as Robin Hood. He went on to star in two more Disney films shot in England, The Sword and the Rose and Rob Roy the Highland Rogue. The elements that make the story better are the ones that are distinctly Disney. The film has some great scenes that are sure to put a smile on any viewers face. In the 1970's, Disney made an animated version of Robin Hood told with animals which has eclipsed this film, rendering it obscure to even big Disney fans. It's a shame that Walt's version is the one that has taken a backseat because it is a great film and is a much more faithful adaptation of the original story. The Story of Robin Hood and His Merrie Men is currently available on DVD, but the transfer is poor, using the same source as the previous VHS and laserdisc release and there are no chapter selection options. It is also available on iTunes. You ought to check out Clement of the Glen. He has a whole blog devoted to this movie but he occasionally talks about other Robin Hood movies. Hi, thanks for the link Ladytink. This is my favourite film of all-time. In my oppinion one of Disney's most underrated films, mainly forgotten due to the far inferior cartoon version of the 1970's. It is only recently that due to its release across America critics are starting to realise what an exciting and colourful adaption of the legend it is. It is about time the DVD was available here in Europe! If you visit my blog, dedicated to this movie you will be able to read about not only some of the legendary actors that appeared in the film, but also behind the massive array of talant behind the scenes, such as Carmen Dillon, Guy Green, Muir Mathieson, Ken Annakin to name but a few!